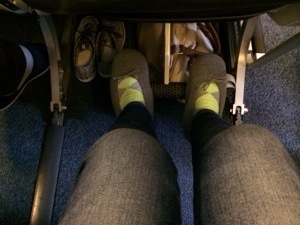 Once I find my seat on the plane, I kick off my shoes & prepare myself for the long, tedious hours ahead. It takes approximately 9-10 hours to fly to Tokyo Narita International airport from San Francisco International Airport. 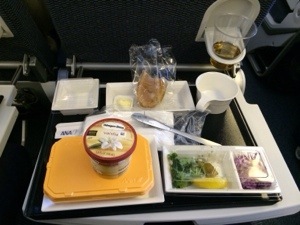 When I fly to Asia, I usually try to book flights on ANA (All Nippon Airways). They have some of the best economy seats with an adjustable headrest, a pull-down foot rest, updated video screen at each seat, & some of the best tasting in-flight meals I’ve ever had. Plus they serve you Haägen Dazs ice cream… Need I say more? 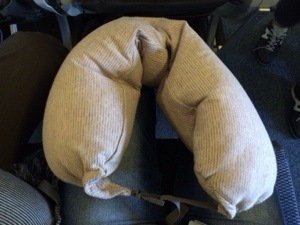 My handy-dandy neck pillow. For the most part, I used it as a back piilow. 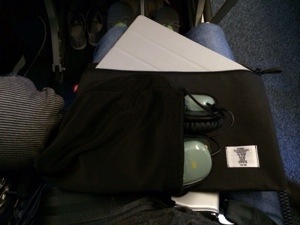 Got my iPad & my noise-canceling headphones. I’m all set to go!! We got lucky. 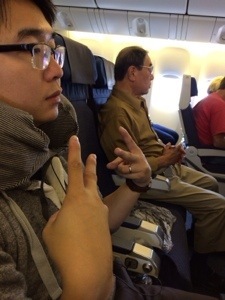 The flight wasn’t so full, so the seat next to us was empty. We almost had the whole row to ourselves! 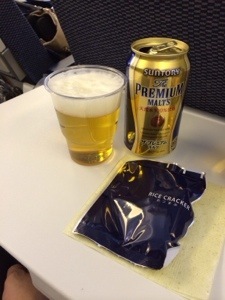 Every time we fly to Tokyo my husband has a tradition of ordering beer on the flight. He usually orders Suntory brand, but this time he drank all 3 brands (Suntory, Kirin & Asahi). 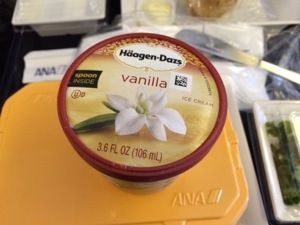 After our amazingly epic in-flight meal (the first of two meals), they served us Haägen Dazs ice cream…which is my favorite brand of ice cream by the way. So, I was a “pretty kitty” after that. BECAUSE HAÄGEN DAZS. THAT’S WHY.